If you’ve decided to grow your own cannabis at home but haven’t done it before, no doubt you have questions. Since lighting is one of the most vital components of a successful grow space, let’s explore the various lights commonly used for cannabis cultivation and learn more about the light spectrums they capture as well as the pros and cons of each. First, let’s define full-spectrum lighting. Simply stated, full-spectrum lighting includes light that covers the electromagnetic spectrum from infrared to near-ultraviolet. It includes all of the light spectrums necessary to grow plants and sustain animal life. In other words, sunlight is considered full-spectrum light. There also are artificial lights that are labeled as full-spectrum, mostly for marketing purposes. Not all full-spectrum light is visible to the naked eye. The visible spectrum captures all the colors of a rainbow. Unfortunately, the incandescent lights commonly used for household illumination will not work for growing cannabis or other plants. Artificial cannabis sunlight requires more of a color spectrum than incandescent light can provide because they produce limited light on the red side of the spectrum but not the blue side. They also run very hot when in operation. Fluorescent lights, on the other hand, are more efficient than incandescent. Although they can provide more of a light spectrum that includes both red and blue light, they do not produce the quality of light necessary to grow plants. There are fluorescent lights that provide a fuller spectrum for growing plants and maintaining captive reptiles—particularly some lizard species that have problems metabolizing calcium in captivity without them—but these fluorescents are in the minority and are not very practical for large grows. Common cannabis cultivation is largely limited to two types of lighting: HID and LED, because of the fuller light spectrums they both produce. Until relatively recently, high-intensity discharge (HID) lights were the standard for growing marijuana. HID light refers to gas-discharge lights. They operate by sending an electrical charge between two tungsten electrical conductors and through an ionized gas (aka plasma) housed within the bulb. The two HIDs most commonly used today for cannabis cultivation are the same as in years past: high-pressure sodium (HPS) and metal halide (MH). These lights have been in wide use for decades, and because the light spectrum for each differs, each has different, specific applications for growing cannabis. Newer to the cannabis space, light-emitting diode (LED) lights provide unique advantages over HIDs, as well as some limited disadvantages. 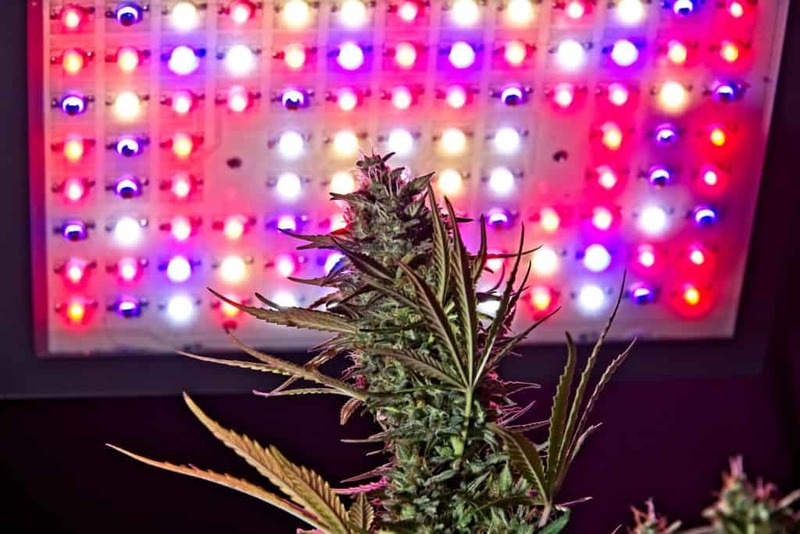 Both HIDs and LEDs enjoy wide use for cannabis cultivation, but LEDs in particular are enjoying more widespread use as the cannabis industry evolves. Cannabis grows particularly well under different spectrums of light at different stages of growth. With indoor grows, what the plants benefit from the most initially will change as they mature. Let’s evaluate the spectrums of light emitted by MH, HPS, and LED lights in more detail to gain a clearer understanding of the specific applications and benefits of each. Metal halide does not enjoy as much use as either high-pressure sodium or LED when it comes to cannabis lighting. The reason is quite simple. Although a useful grow light, metal halide is most useful during the beginning stages of a cannabis plant’s growth. The blue light it emits is very bright, and seedlings and young clones will grow well with it. Blue light is particularly useful during the vegetative stage of growth because the pants will grow short and stout, with healthy and large leaves to absorb the maximum amount of light. The blue light emitted from metal halide closely simulates the quality of light that young plants experience during the spring months. As the days grow longer and the sun rises increasingly higher in the sky, the bright light it produces is more closely simulated by metal halide’s blue-spectrum of light. After the summer solstice and the days begin to grow shorter, the sun begins to hang lower in the sky and the quality of light begin to gain more of the red spectrum. Shorter days and redder light is a sign that the fall months are approaching, and plants respond accordingly and begin to flower if grown outdoors. Because high-pressure sodium lights emit a light spectrum containing a large amount of red, it makes them particularly useful during the flowering stage of the cannabis plant’s life cycle. When subjected to red light, cannabis plants begin to stretch and grow taller. Outdoors, this allows them to reach the light that’s sinking lower in the sky throughout the day and is no longer overhead. As plants stretch under the red-light spectrum, increased space between the leaves occurs prior to flowering. In grows that utilize both metal halide and high-pressure sodium, the lights are generally switched from metal halide to high-pressure sodium while the plants are still fairly small and in the vegetative phase. Some cannabis cultivators are very successful utilizing only high-pressure sodium throughout the entire life cycle of their plants. The plants may stretch a bit and grow a little spindly during the early seedling stage, but they will soon grow to the standard plant structure. If forced to choose between one or the other, using only high-pressure sodium would be the best alternative. High-pressure sodium is very good at promoting the development of large, dense buds. Although plant under metal halide will develop flowers once the light cycle is switched to the 12:12 ratio of light to darkness, they will not be as robust as they would be under high-pressure sodium. The quality of the flowers will probably suffer as well, with high-pressure sodium coaxing higher levels of tetrahydrocannabinol (THC) from the plant. Because full-spectrum lighting for cannabis is intended to replicate the sun’s rays, LEDs are garnering increasing attention because the lights can be adjusted to capture the full spectrum of colors. As we just learned, this is not true for HIDs. Another advantage of LEDs is that the light does not dissipate to the extent that it does with HID lights. Because of this, HIDs often have elaborate reflective hoods to concentrate their light in fixed areas. These hoods are not a common component of most LED lighting because the light has a more limited, 180-degree concentration of light instead of the 360 degrees from HIDs. Because LED lights are adjustable, when growing cannabis with them the best practice is to begin with the manufacturer’s recommendations and then adjust them to capture more of the red spectrum as flowering commences. There are some common mistakes that can occur for those who switch from HIDs to LEDs. Fist of all, you won’t need to water as much because the lights run cooler. HIDs emit a lot of heat and infrared light, which dries out plant soil much quicker than when using LEDs. There are benefits and disadvantages to growing cannabis with either HID or LED lights, and depending on the scope of the grow you’re planning, both have applications in the cultivation of marijuana. There is really no right or wrong answer to which type of light to use. So much depends on your budget and overall goals with your grow. Let’s identify some of the benefits and drawbacks of LED. Clearly, there are more advantages to using LED light than using HID, but old practices die hard and HID still has a place with cannabis cultivation—particularly for home growing. Although LED lights are expensive to purchase, their lower operating costs and long life will eventually make up the cost differential. Armed with the information we just covered, you should be able to make a sound decision about what type of light(s) to purchase. Research the specific models you’re interested in and do all necessary research about compatibility with the electrical outlets in your home. Cannabis cultivation has an increasing number of options these days, so do your homework, and good luck with your grow!